Memorable business cards are a necessity in today’s highly competitive business world. First impression is what really counts, within the initial seven seconds it is generally decided whether it is going to generate business or will end being dumped. Distributing cards for advertising business is cheap and effective method. Companies all over the world give their employees business cards with their name and designation imprinted on it. It has emerged as a perfect marketing tool. Easy to carry, employees can give it the customers, the customers on their end find significant information about the company and the authenticity of person they are dealing. Here, a simple card is never going to work; you need Professional Business Card with unique design, perfect layout and attractive fonts that communicate a professional image. In case, it fails to do so then it isn’t doing the intended job correctly. We, S S Graphics are considered pioneers in designing and printing Professional Business Cards. Our business card designers first understand the need of your business then create a card that will help you get noticed and presents your product and service in good light. We offer fully customized business cards, you can choose color scheme, fonts, and graphics. In short, you can get it designed in a way you feel is going to benefit your business; our designers will gladly do it. We, S S Graphics have the state-of-the-art infrastructure, loaded with modern printing equipment and technology that can print any kind of card whether simple business card, graphic cards, UV coated business cards, laminated cards and much more in an array of attractive designs and patterns. Full Color on both sides or one side Business Card Printing. Normal Sharp Corners, Rounded Corners and die cutting. We provide full color laminated folded or varnished and UV coated business card with the help of high quality printing essentials. Business Cards Printing is Easy! 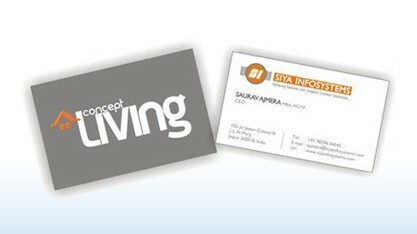 Business cards are handy print materials used by people to exchange contact details with one another. Their small size makes it easier and faster to hand out contact information when needed We offer standard and die-cut business cards. In this day and age, standing out from the rest is a neccesity. That's why we do our best to offer you more options to help you have business cards that are unique Not only are our business cards customizable, we help you get through the whole process with ease. With standard business cards, you can exclusively set your own custom size using our easy-to-use online calculator. Business cards allow your customers to avail your services using the details indicated on the card. These promotional materials are used by all businessmen and service providers. and even event companies and charitable organizations .